Joseph Jose (MPLA) brought together teams all over California for the Manny Pacquiao BALA Basketball Tournament sponsored. by ROS Marketing, South Coast Mitsubishi & B-Ball Junkies. There were 2 divisions that were each awarded a cash prize, exclusive B-Ball Junkies & Mitsubishi merchandise alongside bragging rights and trophy. The winners of the 6’3 and under division was Team Pacquiao from San Francisco and Playing4Eternity from LA for the Open Division. Buddha was chosen as the MVP of the 2nd game that was hosted by the Voice of Venice, Mouthpiece and game 1 was hosted by Knowa Lazarus. Sounds were provided by DJ Rose (Jenni Rodil) of Walnut, CA. Video shot & edited by @lawsthatattract. Stay tuned for an upcoming basketball tournament with a higher cash prize coming soon! Stay tuned as we announce upcoming events for fight weekend including parties & viewing parties in Vegas and throughout the country. Google & Phil Dev held their annual Innovation Summit at the Google Sunnyvale, CA offices where there were a variety of speakers and panels from venture capitalists, non profits, executives and start ups. Roslynn Alba Cobarrubias moderated a Q&A with entrepreneur, Mark Arcenal, founder of the Illest and Fatlace brands. After 20 years of experience in designing brands for other companies like Nike, GAP, EA and many more, Mark has created a global brand that has sponsored great athletes and artists, creating loyal longevity. Video of the talk will be coming soon, for now view the photos that include a presentation by DJ Q-Bert & Yogafrog of the Invisibl Scratch Piklz as well as Phil Dev chairman, Dado Banatao and sons. As a billionaire known to create a microchip found in every computer today, he spends most of his time giving back, working on philanthropic projects with Phil Dev. More info about PhilDev below. PhilDev envisions a prosperous Philippines. With its mission of eradicating poverty through the benefits of science and technology, it builds and strengthens links for knowledge, capacities, and opportunity exchange. PhilDev’s mission planning began in the United States, and established our main office in the Philippines. In the Philippines, we respond to the vision by bringing together multisectoral partners to exchange ideas and share initiatives on the role of science and technology in national development; connect people and organizations in creating scalable and sustainable solutions to domestic needs; and advocate for innovative ideas and usher them to a global platform. In the United States, PhilDev mobilizes the Filipino diaspora to give back and support technology-driven innovations and entrepreneurship in the Philippines. We develop links with private industry and universities to share resources, expertise and collaborate with counterparts in the Philippines, as well as granting scholarship opportunities. PhilDev was founded by Diosdado “Dado” Banatao, one of Silicon Valley’s most significant men, and together with like-minded Filipinos, committed to make a difference and give back to the Philippines in the way that they knew how. Through their combined efforts and influence, they have been able to initiate programs in education, start-ups and mentorship. Founded in 2011, PhilDev is a registered nonstock, nonprofit organization. @EATPLAYMOVELA is the first Filipino Angeleno Food Festival, it is a new kind of Filipino American inspired event held to benefit its organizing non-profit organization, the Filipino American Heritage Movement of Los Angeles. #FAHMLA encourages Filipino American businesses and economic growth in LA. We talked to some of the vendors at this year’s festival & listed what we felt was the #BestThingOnTheMenu that day. @restaurant_adia @grublifeCA @pointpointjoint @dksdonuts @ensaymadaproject @wanderlustcreamery @whiterabbittruck @paellapaella2017 @eatshrimpdaddy @k2birds & so many more were onsite to enjoy by the thousands of people that day. Special thanks to @asiaaragon for stopping by. 9-1130AM at Lana Lane Studios. POW! WOW! Hawaiʻi is excited to announce the return of the POW! WOW! Hawaiʻi School of Music (PWSoM), a two-week intensive music training and mentorship course focused on music education and artist exploration for Hawaiʻi’s youth. PWSoM will provide a unique learning opportunity for a select group of student musicians of diverse backgrounds and musical styles between the ages of 12-18 who will explore the intersection of artists and art within the island community. The students will participate in a wide range of classes including music theory, music fundamentals, composition, improvisation, live sound, recording, performance, and the music business. Both local and national musicians, teachers, and music industry professionals will serve as the guiding force behind each lesson. Through this unique dynamic, teachers and students will compose, brainstorm, invent, collaborate, explore, and create together. The culminating event – a live music concert at POW! WOW! Hawaiʻi’s closing night festivities on Saturday, February 14, 2015 – will debut the students’ collaborative efforts in creating original musical arrangements and compositions. 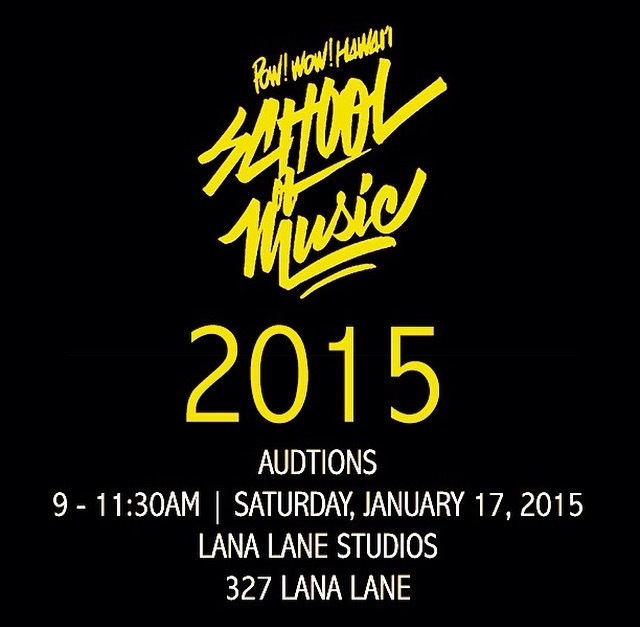 Musicians and singers (age 12-18) are welcome to attend the “Open Call” on Saturday, January 17, 2015 from 9:00am – 11:30am at Lana Lane Studios to meet the teachers and program coordinators. At the “Open Call,” the perspective students will be evaluated on their skill level, ability to be mentored and a willingness to collaborate for placement into the program. Official invitations will be sent to those selected on January 25, 2015. Each PWSoM teacher and artist delivers fresh, innovative ideas and teaching styles to the program. Each individual brings with them an incredible background of contributions to the local and national music scene. 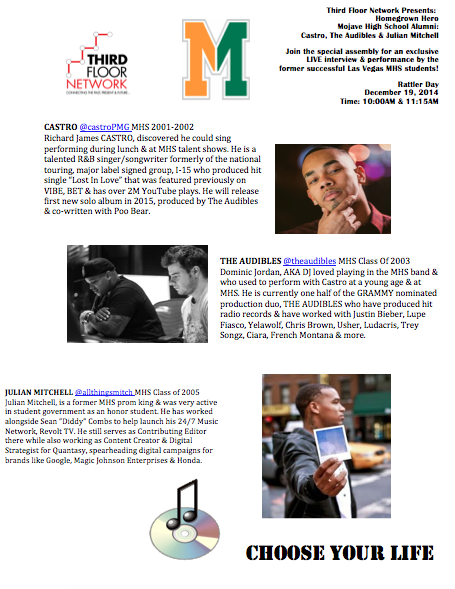 former successful Las Vegas MHS students! Castro and The Audibles discuss meeting and working together after all of these years after highschool, the new sound of Castro’s new album “You Fetish” co-written by Poo Bear his relationship with his former group members. We take it back to the I-15 days and sing radio host @roslynn and @marinaemmm ‘s favorite song by the group that got them their record deal with the Audibles in studio with Castro.